It is a glorious, much-deserved day off of work. I’m enjoying THIS moment. Enjoying this absolute milli-second I am in. Enjoying it so much that I don’t want to hit the stop button. Stop would be delightful — stay here all the time, wrapped up in all this goodness that is making me a happy woman today. But stop is not good enough. Pause lets me take a moment to breathe in and out and hear myself do so before moving on to the next breath. Pause let’s me see — really see — the first specks of light as they came through the living room curtains this morning before hitting play and wrapping myself up in the warm sunshine streaming through the stained glass windows here five hours later. 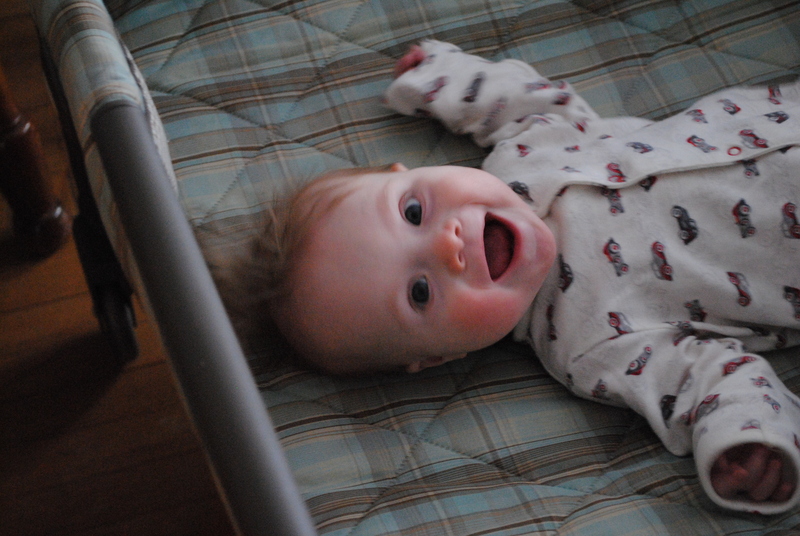 Pausing gives me sighs and barely audible stirs of the littlest man I love over the baby monitor as he squeezes in a few more minutes of sleep this morning and relishing in that joyful noise before hearing the cries that I can calm, the laughter that I can share for most of the rest of the day. I’ve taken advantage of a fuss-free morning with The Dude who has entertained himself with his reflection and his new trick of rolling easily and pleasantly from his belly (which was an accomplishment in itself just a few days ago!) to his back. I’ve swept floors, dusted furniture, sorted through piles and completed a load of laundry. The laundry basket is still at my feet, reminding me that the baby’s clothes need folded and then all of our laundry needs put away. There is an entire upstairs to try to clean, a dishwasher to unload and then, if I’m a lucky girl indeed, a book to pour over and a camera manual to sort through. 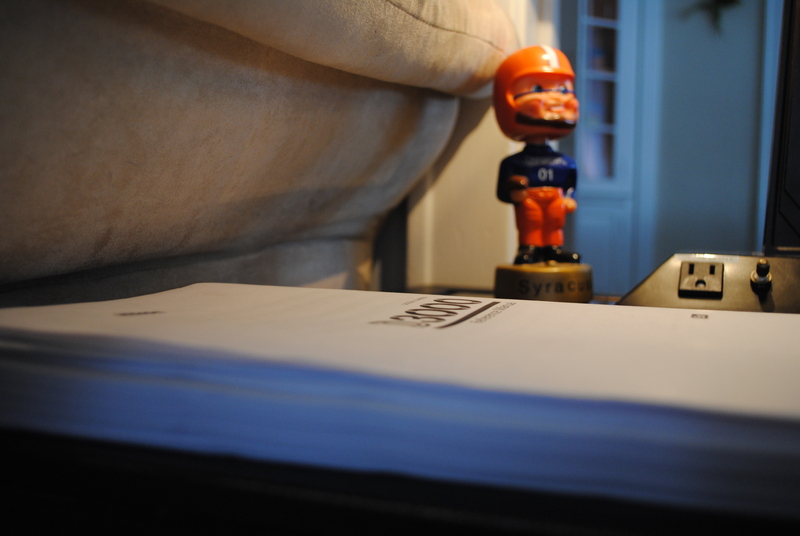 I’m pretty sure my Syracuse bobblehead man is laughing at the huge stack that is the user’s guide for my favoritest toy. I pause because there is a little Yorkshire Terrier curled up in a ball on the corner of the other couch, one eye toward me and my movements. 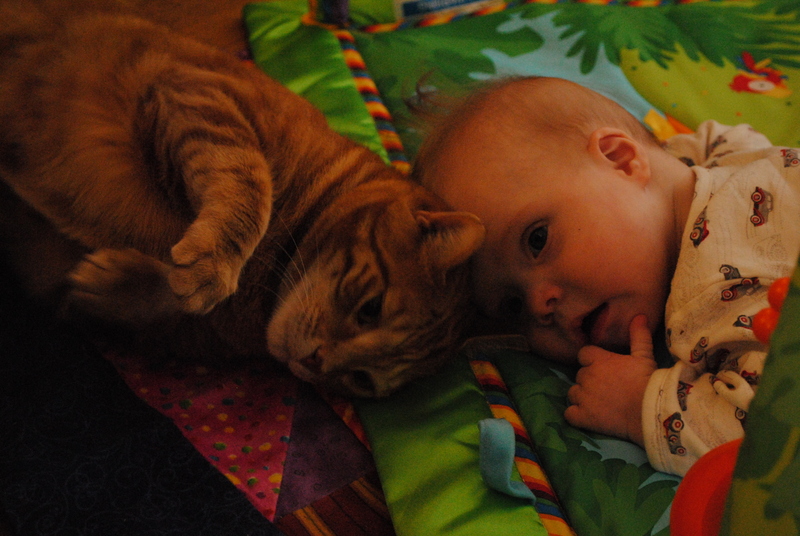 An orange cat is purring in his sleep nearby. The rate at which I blow my nose from this three-week-long cold is starting to slow down and I can appreciate the cookie-smelling candle burning away in the kitchen, where I just made eggs at 11 a..m because I could. 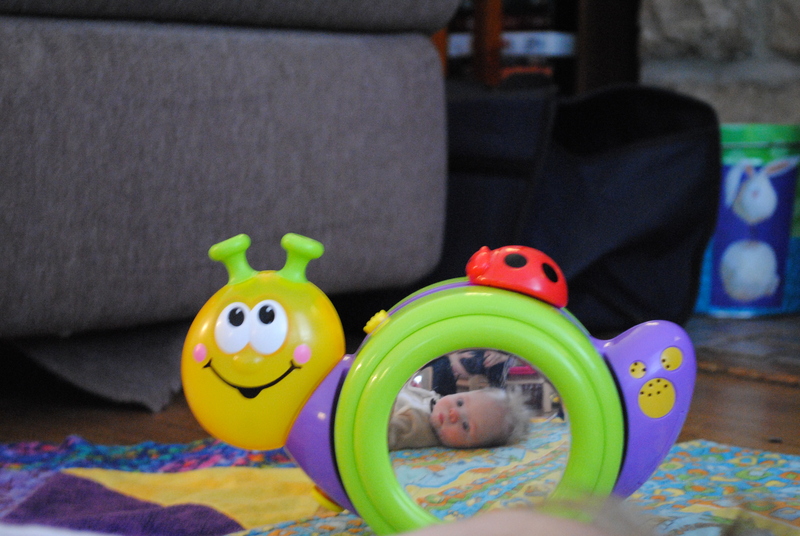 I pause and admire the relaxation that Baby Einstein’s Lullaby Time really does bring me, even if I can recite the words by memory and list the songs played in order by heart. A top spins on the screen right now — it is so simple but so chaotic. Around and around, so quickly you can’t make out its pattern at first. And then as it slows you see red, and some yellow, a circle or two. It comes to a stop and you just admire and can’t help but smile. I am that top. I go and go and push and push and even if I come to a stop — or a pause? — I spin right back to where I was and where I should be within a second or two. There is just enough snow outside to blanket our small-town world in a cleanliness I’ve never felt before. I can’t stop peering through the windowpanes at the whitened tree branches and heavy bushes. I spent more than an hour on the phone this morning with a dear friend. She laid on the floor with me, albeit in spirit, as Zack and I chatted in a smattering of vowels and consonant sounds. She was there, like she’s always been. But it made me miss her more — and appreciate her friendship that much more. I pause peering at our wedding photos. I thought that was the happiest day of my life, but surely today is, no? These quiet days of nothing much and not that important that fill my heart and soul with a loveliness that makes me feel so complete. I reflect on the man that has been my best friend for four and a half years and who became my husband a little over a year ago. The man who became a father five months ago but became a Daddy just in these past few weeks, as his funny games with sounds and exaggerated faces make me beam with pride. It has all fallen into place, this rag-tag team of three. We know our place and we love where we are and who we are. And then there is my other man. Despite stuffing teddy bears on each side of his head when I put him in the swing for this nap, he managed to squirm the “lovey” bear out and now his left cheek is resting on the plastic of the swing, mohawk coming oh-so-close to hitting the support bars of our favorite naptime apparatus. His right hand clutches “huggy” bear and his feet hang below, every now and then twitching with a dream. Since he woke up this morning, he has reminded me of my place in this crazy world. It involves dirty diapers and spit-up and stinky formula, yes. Oh, and the early wake-up calls! But, it’s so very much more. Being a mother is the most fantastic thing I’ve ever done. Sometimes I forget and sometimes I let other people or other things make me feel differently. But they can’t take this away. Not this feeling. Not this moment. And I pause to remember my own mother. I’ve been missing her a lot lately. I made it through the holidays rather unscathed this year, which is a feat in itself. But now, the crazyness has died down and in these quiet moments I pause, she is there. In the car with a silly old country song. Or in my mind, images and memories on repeat. How is it that she’s not here? That she can’t pause with me. It’s hard not to judge her and her decisions now that I’m a mother. It’s harder to forgive than it used to be, impossible to forget. And now my ramblings have really let loose. 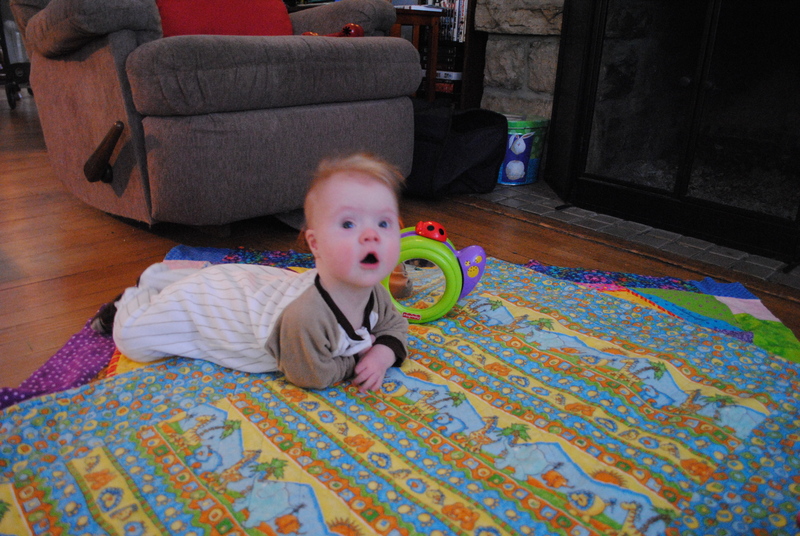 Before I lose all control, it’s time to hit the Play button, fold that laundry, tend to the baby who is starting to stir. We will snuggle and laugh. Maybe I’ll clean. Maybe the dishwasher will be emptied. I will definitely snuggle. I will definitely laugh. I will definitely be complete. And thankful for the pause. And incredibly grateful that my son is accomplishing so many things in such quick succession. The belly time is GREAT. The lifting up of the head is HUGE. And the flipping onto his back just makes me so giddy. I was practically jumping out of my skin to tell the physical therapist yesterday and she was so pleased — especially when Z-man showed off his new skill right then and there for her. Every flip is a reminder that the screaming exercise sessions or the leg lifts sacrificing cuddle time are all well worth it. When I walked into his room this morning and he was on.his.STOMACH! 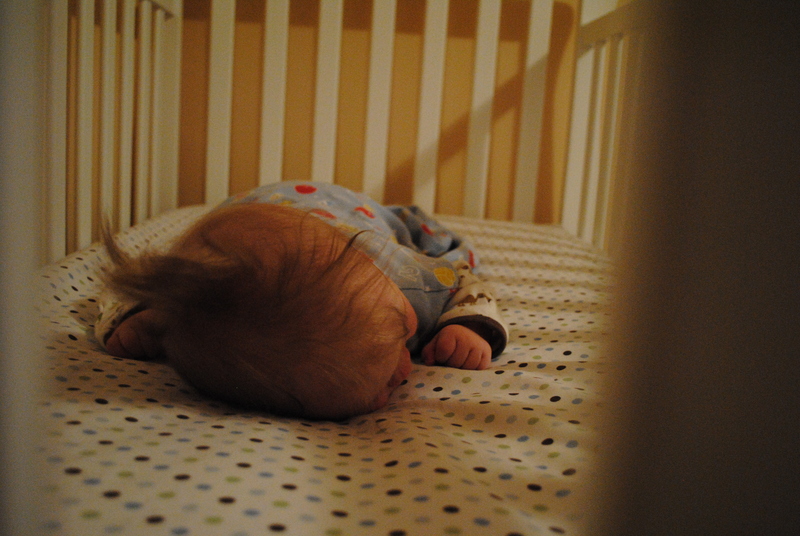 I could have (and might have) done a happy-happy dance right there in front of his crib. Maybe I’m naive, but it makes this “syndrome” seem a lot less horrifying. It’s all just so awesome. This entry was posted in Uncategorized and tagged Zee Family, Zee Momma. Bookmark the permalink.